Maybe no one was paying attention because it was the first day of the NCAA Tournament. Maybe missing the World Cup and then taking over a year to name a new coach has not only dwindled the excitement around the USMNT, but the interest as well. Or maybe we just let it slide because we’re all finally getting smarter. No matter what it is, we all deserve a round of applause. Congratulations to us for (so far) not overreacting to the USMNT. Gregg Berhalter’s first three games in charge of the USMNT have gone just about the complete opposite of Jurgen Klinsmann’s first few games in 2011. Klinsmann’s reign opened with a draw and two losses, ultimately winning just one of his first six matches. Berhalter has won his first three matches, preserving clean sheets in each match. In 2011, Klinsmann faced heavy criticism for the team’s slow start. He was promising change and the results on the field were lackluster. This was wrong! None of those games counted. They were all meaningless friendlies and the immediate criticism laid the foundation for what was ultimately a very strained relationship between Klinsmann and the media for the duration of his career. Berhalter has faced the opposite. His tenure has opened up with a 3-0 win over Panama, a 2-0 win over recent Concacaf foil Costa Rica, and a 1-0 win CONMEBOL side Ecuador. There’s been no overreaction. No one is saying Berhalter has brought the change that US Soccer needs. Perhaps that’s because we all know the January games don’t mean anything or how lucky the win against Ecuador actually was. Whatever the reason was, it’s very good to not overreact. In fact, in order for US Soccer to really grow under Berhalter, I don’t want to say we need to ignore the USMNT, but we certainly need to keep disregarding their match results for the foreseeable future. And that includes up to and through the Gold Cup. Jurgen Klinsmann may have had trouble conveying his long term plan to players and the media, but Gregg Berhalter’s on-field tactical style is already evident. We may not like it sometimes. 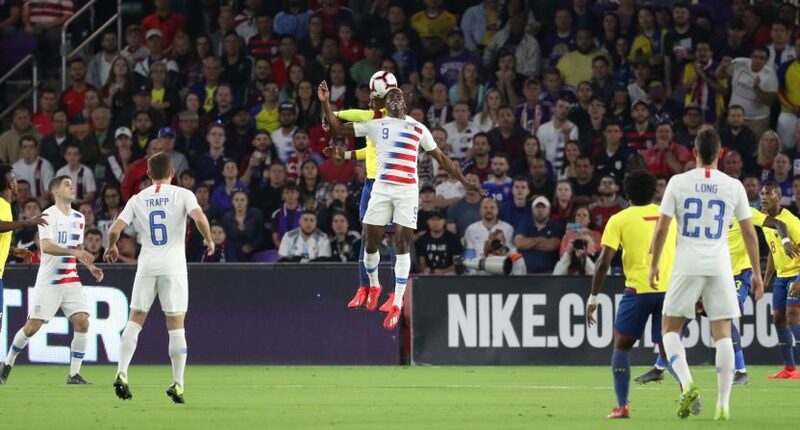 Some fans who dream of a Christian Pulisic, Tyler Adams, Weston McKennie midfield may not like seeing Adams lining up as a left back; but if this system works, it gives the US more flexibility. As I wrote last week regarding England, flexibility is a good thing! When Berhalter announced his roster a few weeks ago, another thing we collectively didn’t freak out about (go us) were some underwhelming selections, namely Michael Bradley, Omar Gonzalez and Gyasi Zardes, on the USMNT roster and additionally leaving young forwards Timothy Weah and Josh Sargent off the squad while Jonathan Lewis, with one MLS start in 18 months, remained with the team. Unlike previous managers, Berhalter’s choices weren’t making any statements regarding the quality of MLS vs other leagues. Rather his selections were all made for a specific reason. Berhalter is bringing a brand new style to the USMNT. His first camp with a full roster had just two days of practice before their first game. Because of that schedule, Berhalter chose to only work on integrating his European defenders and midfielders into the new system, saving the forwards for a time when they have a longer camp. I’m not going to go into a full tactical breakdown. The gist of the new US setup is to build around Pulisic and McKennie playing in dual number 10 creative roles. That requires the striker and wingers to do very specific things. Those three players need to occupy four defenders in order to give Pulisic and McKennie the space they’ll need. That’s why Berhalter only called in forwards who were in the January camp, because it’s too much to learn in such a short period of time. The next time the USMNT will get together will be in preparation for the Gold Cup. It’s important for Berhalter to stick with teaching this system during that tournament. For the rest of us, it’s important to remember what the ultimate goal is, and that does not necessarily involve winning the Gold Cup. Berhalter is playing with house money this summer. In previous years, winning the Gold Cup was important to qualify for the Confederations Cup. That tournament no longer exists, giving Berhalter an entire tournament to work on his new style before World Cup qualifying. If the US don’t fully grasp that new style and crash out of the tournament in the quarterfinals, so be it. The ultimate goal here isn’t to win Concacaf titles, it’s to be a threat to someday win the World Cup. Four years ago, Jurgen Klinsmann tried to establish John Brooks and Ventura Alvarado as his first choice center back pair in the Gold Cup and only Brooks ultimately worked out. The idea behind it wasn’t bad; had it worked, Klinsmann would have had a pair of 22 year old CBs as a pairing for years to come. If Berhalter does the same thing this summer, it shouldn’t matter what happens. If Berhalter wants to take Gyasi Zardes as his first choice striker, while mixing in Josh Sargent in a few group games, that’s fine. Problems this summer will arise for two reasons. If instead of integrating young guys like Weah and Sargent in, Berhalter sticks by guys like Zardes game after game because they know the system. Or if the fans and media start getting on Berhalter because the results start getting bad. I want to see the US win every tournament as badly as the next guy, but not at the cost of forgetting the ultimate goal. We’re not here to win Gold Cups, we’re here to try and win a World Cup. If Berhalter takes us to that level, winning Gold Cups will be a breeze.